The JBL OnBeat™ Air will revolutionize the way you listen to music. 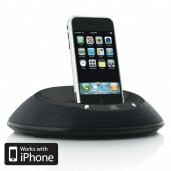 It wirelessly streams your entire iTunes library from any Mac or PC – or from any iPad, iPod or iPhone running AirPlay – to any room in your house. Now you can access any song or playlist from any compatible device within range of your Wi-Fi® network, with full playback control via an IR remote. But JBL OnBeat Air is more than just a great-sounding music system. An ingenuous rotating connector firmly docks your iPad, iPod or iPhone for syncing and charging, and lets you position iPod and iPhone screens in portrait or landscape orientation for the best display of video content. With an optional composite cable, it can even send photos and videos to your TV for the whole crowd to enjoy. Featuring dual JBL® Phoenix full-range transducers with computer-optimized DSP equalization, JBL OnBeat Air will fill your room with a dynamic, lifelike 360-degree soundstage. 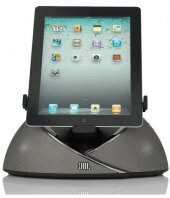 JBL OnBeat Air is among the most versatile, capable and powerful loudspeaker docks JBL engineering has ever produced, with the industry-leading performance you expect of JBL products. JBL OnBeat™ Air features a powerfully tuned digital audio path. The clean digital amplification delivers high output, crystal clear sound. 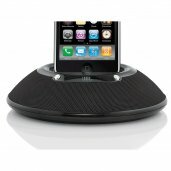 RF remoteAirPlay wireless music streaming. AirPlay technology gives you wireless remote access to your entire iTunes 10 music collection and iTunes Internet radio with full navigation and playback control via your iPhone or iPod touch device with Apple’s free Remote app. Works with any Wi-Fi® network. AirPlay is easy to set up and use with virtually any Wi-Fi® network, including WPS-protected systems. Using the included IR remote control, you can navigate your iTunes songs, playlists photos and videos, change tracks and system settings, and more, from up to 15 feet (4.6m). Touch volume controls and status LED. Convenient touch-pad controls let you raise or lower volume and mute or unmute the system with just a tap. When plugged into AC power, JBL OnBeat™ Air will charge your iOS devices without a computer connection, even when the system itself is off. Connect the JBL OnBeat Air to your desktop or laptop computer via the USB connection and you can easily sync your iTunes collection to any docked device. Even if you’ve never owned a JBL® product, you’ve almost certainly heard the JBL sound. It rings out loud and clear from the massive JBL loudspeaker arrays that hang in stadiums, sports arenas and outdoor concert venues everywhere. It literally surrounds you in more than 50 percent of all movie theaters worldwide, including many THX-certified installations (a standard of realism that JBL engineers helped pioneer in 1983). Chances are, many of your favorite songs and movie soundtracks were mixed and mastered on JBL studio monitors – they’ve been the choice of audio professionals for more than 60 years. But you don’t have to venture far from home to experience the legendary power, clarity and technical accuracy of the JBL sound. It’s available in exceptional home entertainment systems that incorporate many of the same advanced technologies, materials and manufacturing techniques originally developed for professional systems. It’s even available in lightweight, portable packages that you and your friends can enjoy anywhere. This item is features a one-year parts and labor warranty. Positive from start to finish.